It all started back in 1991 when our love and obsession for private number plates was born. Since then we have grown steadily over the years to become a leading light in the private number plate industry holding our own stock of high quality number plates and many thousands of registrations we are selling for trade and private clients including many celebrities and sports personalities. We pride ourselves on our excellent reputation for customer service and competitive prices and have many letters of recommendation from our customers over the years. We will always go the extra mile to ensure you receive the highest levels of service. Our team of trained personalised number plate staff will professionally handle your transfer as swiftly as possible with all paperwork change over handled for you including the V5C, tax and MOT records. We offer advice without technical 'jargon', and are always competitive on price. Regplates.com have embraced the social network revolution and have a number plate news blog which is updated frequently with private registration news from around the world. We also have a facebook fan page with pictures sent in by some of our reg number clients. Our private number plate twitter feed has many unique special number plate articles and offers for sellers and buyers of cherished car reg plates. We have also launched a youtube channel with tutorials, number plate advice and a whole range of other top tips for number plate lovers! 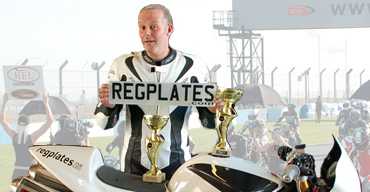 Regplates sponsored rider Ian Popplewell with some of his many trophies! Local legend and National Champion Ian Popplewell completed the season as overall Champion in Thundersport GB under the sponsorship of Regplates.com. As well as our website, we also regularly advertise in many of the 'National' publications such as Autotrader, Autocar, The Journal, The Daily Mail & The Sunday Times where we offer a selection of registrations owned by us for sale. As a company we sponsor sporting events such as the 'White Gold Cup', and many local events for clubs, charities and schools. 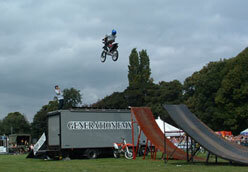 We also sponsor the Generation FMX freestyle motocross team. We support the Dr. Hadwen Trust which is the UK's leading medical research charity funding exclusively non-animal techniques to replace animal experiments, benefiting humans and animals. Why not let our experts take the stress out of buying or selling your registration mark. Browse through our website, and if you need any further assistance, we are on hand from 9am until 7pm Monday - Friday, Saturday & Sunday 10am until 5pm. We guarantee a fair and professional service at all times.